From romantic visions of gladiators to the mysteries of the Da Vinci Code and the Roman Catholic Church, no city is more interesting than Rome. At the heart of the country of Italy is the city of Rome. From being the center of an empire to now being the seat of Catholicism, Rome always has been and will be an important part of the world's culture. How did it come to pass that one small city took the world by storm? Here are some facts about Rome that can help to explain its importance and influence on the rest of the country, Europe and the world. Rome started out as a small village located in what is now the country of Italy. Its roots trace back to the ninth century BC, although the traditional mythical date of birth for Rome is April 21, 753 BC. The name Rome comes from origins that are disputed among historians, but it is generally thought to have come from the Etruscan language. Etruscan was the major language spoken in this area when Rome was founded, and it is believed that the founders of the village/city were probably Etruscan and later assimilated into an Italic population. In around 500 BC, the Romans residing in the city gained their independence from the controlling Etruscans and were well on their way to creating an empire. By 44 BC, the Roman Empire was established, and the city of Rome was its capital. Estimates state that in the facts about Rome, Italy, at one point in this early era the city may have had a population of up to 3.5 million people. The population soon declined, however, after the peak in the second century AD. Plagues and other misfortunes killed off members of the population and drove others away from the city of Rome. Medieval Rome saw the city falling into disrepair, even though some of the emperors tried to grant money to subsidize repairs. In later parts of the Middle Ages, religion bolstered the area, making Catholicism an important part of Rome, as the pope found a home here and the Holy Roman Empire was established. 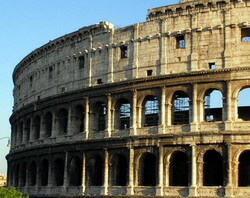 In the 15th century, Rome saw the Renaissance come to its area with a wealth of knowledge, education and art. The Sistine Chapel and St. Peter's Basilica were both built during this time of art and religion combining. This period, until the 1800's, saw a string of ruling popes and monarchy government for Rome, ending finally in 1861 when Italy became a united country. Rome is still a very important city within Italy, and it's still important to Catholics all over the world. As the home of the pope as well as the home of much art and history, Rome will always be a big part of our culture.